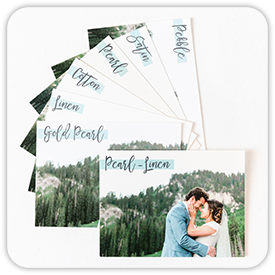 Pro Digital Photos is now offering custom foil cards. 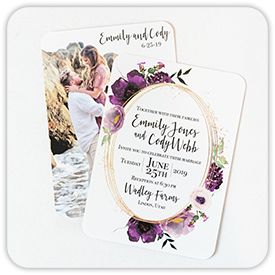 With 7 fancy colors to choose from, you can now add some real 'bling' to many of our standard card sizes. 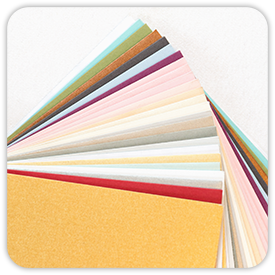 You can request paper samples to see our paper types and finishes. We also offer Rush Services. Prices below are for a 2"x3" area of foil. Additional foil can be added for $.20 per inch (2"x1"). Please call for a quote on your specific card requirements. There is a setup fee of $20 per foil design. Folded foil cards only have the ability to have foil on the front panel. 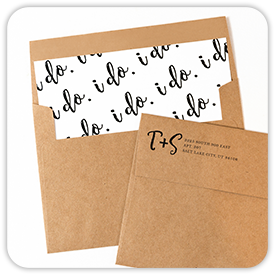 Call us with any questions or more details on adding foil to a folded card. Our plopper's are for cards and products that you have already had designed or have created yourself and are ready to print. This means that you have images that are setup to the correct size and layout with the correct amount of bleed. We have downloadable templates on our plopper's how to order page so that you can be sure you've set them up correctly. There are 3 pages required for a foil card. The front and back full color printing files (do not include foil elements on these files) and the foil layer. The foil layer will simply be a black and white .jpg file, where black will be foil in the final print. Be sure your file is Black and White only, NO gray or gradients. Pricing for foil cards cannot be calculated by our website. We will contact you with specific pricing after we receive your order. 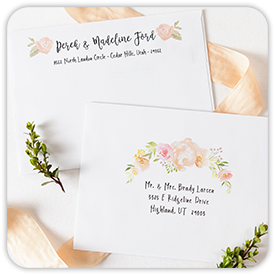 You may also place an order simply to get a price quote for the card you have created.